bestelectronicsn1 has no other items for sale. The PIXMA MG2522 is an all-in-one printer that is the ultimate solution to any home printing needs. Using inkjet technology, this printer makes it easy to produce high-quality, full-color print outs. It's easy to integrate into your desk setting thanks to its compatibility features. It features one 2.0 USB port for seamless connectivity and supports print sizes of A4 and A6. Fast shipping and good condition, thanks! A great and very useful printer for an incrdibly good price. Yes! Great Ebayer. Quick Delivery. Thank you so much! Terrible communication, would not file claim for lost printer. Tried to cancel before shipping. Ignored and shipped anyway. The printer appeared new but does not print anything. So far looks to be much better than HP units I've had. Wish they would give you full cartridges, but at least Canon tells you they are shorting you (use different numbers) Replacement cartridges cost more than entire unit, but that's the nature of the game. I was in the printing industry and know what ink costs...pennies at most, so paying $30 for 3 cents worth of ink tells me what the industry cartel is like. Good printer for now, too bad corporation(s) have to do this to us. The print is ok on this printer , but it is not nearly as smooth running as my old one which is the very same model . The main reason I bought a new printer is that on the old one the heads were getting dirty and smearing the print . This printer would be ok but it has to jump , shake and clatter before it begins to print . Easy to use and fast. Needed a print cartridge after a short period, but is still printing while I wait for print cartridge to come in. It is loud when it starts printing, but as long as it does not affect the printing this is not a problem. Have had no paper jams. Holds sufficient paper and starts right up when you add paper without having to hit buttons. It is a bargain and I have no problem with the performance. 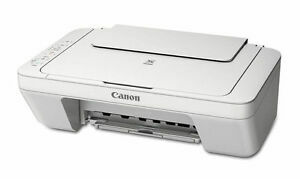 If you don't have to have wireless this printer is a great choice for a home printer. It's print quality is great and it has quite a bit of versatility. I wish it had a sleep mode so you don't have to turn it on for every print job, but given the cost of the printer I can live with turning it on every time. I like the fact that the cartridges are also more affordable and if you buy a generic cartridge it will work unlike the Lexmark printer I just replaced with this unit. I am not a fan of company's that force you to use only their products with no options. This seems to be a good printer for the money and I recommend it to anyone needing a affordable printer that should give years of service. I didn't expect much for the cost of this printer but what a lovely surprise I got when it was set up and showed me what it was capable of. Nice clear printing and copying. Much bigger than I thought it would be approx., 16 x12 and so easy to set up with clear instructions and many more features than my old HP copier. While checking around the internet, I found I can purchase a black and a white ink cartridge for the same price as what I used to pay for the HP ink. A great saving on printer/copier/and ink. Don't pass up this great deal!